Hurricanes, tornadoes, floods, fires and even lightning storms all have something in common. When they hit the wrong location, they can cause costly damage and put lives at risk. In 2017 alone, hurricanes did more than $265 billion in damage in the U.S. and widespread wildfires took an additional $18 billion toll. Buildings that are under construction are at high risk in these instances. For construction professionals, understanding this risk is critical. 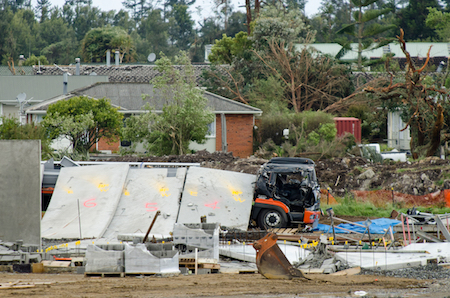 Construction sites are at higher risk than regular commercial properties during disaster times for a number of reasons. First, the standard measures that would protect a building from a disaster, such as earthquake-proof structures or internal fire reduction systems, are not yet in place. This means the damage could be far more extensive to a building under construction than for the same building after the construction is complete. The risk at a construction site increases because of the equipment, tools, and materials on site. These can turn into projectiles in wind storms and can be the cause of fires. Also, damage to equipment or materials can increase the costs of a disaster significantly. Construction crews need to know how to spot these risks so they can take measures to reduce them. Every construction site needs to identify the risks that are prevalent in their geographic area, whether they be hurricanes on the coasts or tornadoes in Tornado Alley. They then need to create an emergency plan to help reduce the risk associated with these threats. Finally, construction site managers need to ensure that their team members are properly trained as to what needs to happen in a disaster. With these three steps, the overall cost of a natural disaster will be much lower, and everyone on the site and around it will be protected. This guide is intended to be a comprehensive resource to help construction industry pros and concerned citizens who live near construction sites know what to do to protect themselves and their investments in a natural disaster. By taking the precautions in this guide, a construction site will be well prepared for any dangers that nature can throw at it. When you live near a coast, being prepared for hurricanes is essential. Hurricanes cause widespread damage through the storm path, and hurricane damage estimates sit at around $28 billion per year. 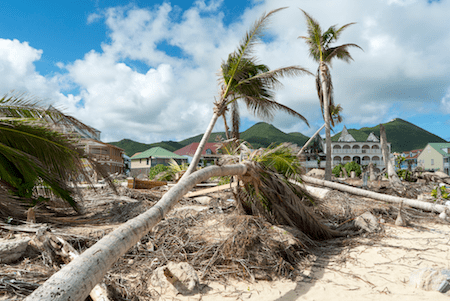 After a hurricane, while companies try to recover, the cost of building materials can increase, and this can make it difficult to rebuild and get back on track. 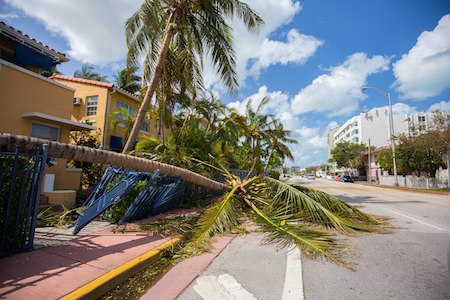 Large equipment can be damaged or completely destroyed due to the high winds and debris of a hurricane. If you live near a construction site, your risk becomes higher. 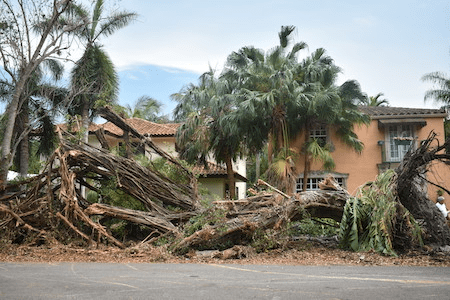 Large equipment that sits in the path of a hurricane or the supplies for the building project can turn into projectiles, causing serious damage to the surrounding homes and properties. If the construction crew does not take the right measures to tie down equipment and supplies, your home can be at risk. If you live in a hurricane zone and notice construction around you, or if you work at a construction site that’s in the path of a hurricane, there are steps you can take to protect yourself and your investment. Here are some ideas to help you prepare for a hurricane even with construction equipment around you. Understand the risk of upended equipment from winds. A Category 4 hurricane with winds of 130 to 156 mph can topple trees. This wind is strong enough to pick up construction equipment and move it across the construction site and into surrounding properties. Category 5 hurricanes are even more likely to do this. Recognize the risks of flooding from a storm surge. Hurricanes cause a phenomenon known as a storm surge, which is a rise in water level above the normal high tide on the coast. This can cause flooding. In construction areas, toxic chemicals, like paint, gasoline and cleaning agents, are common, and flooding can pick up those chemicals and transport them to other areas. Understand the increased risk of flooding from extreme rainfall. If the storm causes severe rain, then the risk of flooding increases significantly. Hurricanes often drop six inches of rain per hour, and this can cause catastrophic flooding. In fact, flooding accounts for over half of the deaths in hurricanes and also ruins equipment that is left exposed. Construction sites that are located on coastlines need to know what precautions to take to protect people and property when a hurricane hits. Here are some strategies that will provide critical protection. Construction sites should never be occupied during a hurricane. The risk of injury to crew members is too high, so when a hurricane is approaching, work needs to shut down, and people need to go home. Move long-term material storage away from areas prone to flooding. Materials in flood areas will be damaged, and chemicals will leach into flood waters and hurt the surrounding communities. Store materials higher than ground level if possible and away from clear flood zones. Create two teams, the Hurricane Response Team and the Hurricane Recovery Team. The Response Team will know how to prepare for the hurricane event, while the Recovery Team will be trained how to deal with the aftermath of a storm. Have a list of supplies and materials. Should something be damaged or go missing after a hurricane, having a list of the major materials on site will help with identifying missing inventory. Reduce the amount of accumulated debris and scrap metal on site. These easily become windblown hazards in a hurricane, so eliminating them before the storm will help protect the job site and the surrounding community. The scrap that cannot be eliminated should be tied down and stored more securely or placed in a sealed dumpster. Empty dumpsters before the storm hits. If you know that a storm is approaching, empty all dumpsters. If you cannot get them emptied in time, have them covered with nets to prevent the contents from turning into hazards. Anchor or remove barricades and loose buildings, like portable toilets. Barricades are easily picked up by the winds of a hurricane. Non-essential barricades should simply be removed during the storm. Essential ones should be properly anchored to reduce this risk. Protect underground piping and storm drain systems. If these are not yet completed, they could easily be infiltrated with sand and silt during flooding. Take measures to protect them before the hurricane hits. Prepare cranes for the storm. Lower the booms, raise the hook and allow tower cranes to weather vane so they can better withstand the storm. Prepare other large equipment for the storm. Top off fuel tanks, anchor lighter pieces of equipment and protect valuable equipment from flying debris. Establish an off-site place to meet. There may be a need to meet to discuss restoration after a hurricane. Establish an off-site place where the Hurricane Recovery Team can meet to discuss what needs to happen next. Secure building framework. Banding, concrete fill, and heavy structural steel components can help keep building frameworks in place during a hurricane. When this isn’t possible, remove the frameworks to prevent damage. Protect the site from flooding. Cofferdams, sandbags, and other similar products can help prevent some of the flooding associated with hurricanes. Have a relocation plan for equipment. 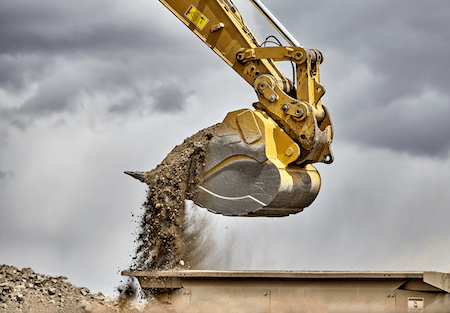 Large equipment like excavators and drum rollers can be damaged in a hurricane if your site is in the storm’s path, so whenever possible, relocate costly equipment to higher or protected ground. What Can a Concerned Citizen Do? Contact the site manager to ask about safety protocols. If you can find the contact information for the site manager, contact them when you know a hurricane is coming and find out what their protocols are. Ask what the hurricane plan is. If you live or work near the job site, you have a right to know that the company is taking the necessary precautions to make the site secure. Feel free to ask what their plans are. Keep in mind, though, that they may be busy preparing, so be respectful of their time. Know the local regulations. Many hurricane-prone areas have regulations that require construction sites to work in a hurricane-aware manner. Familiarize yourself with these regulations and see if the local construction site is following them. Have a system in place to notify the on-site crew when it is safe to return. Make sure the team knows when they should report back to work. Have a safety inspection crew ready to see the site, then a system in place to contact crew members so they can return to work only when it is safe to do so. Use caution when assessing damage because of potential post-storm hazards. A construction site will have numerous hazards after a hurricane including toxic water, jagged debris, and unstable buildings. After getting the all-clear to return to the site to assess damage, crews must use extreme caution. Have a plan for water removal. Water removal is one of the first and most important things to tackle after a hurricane. Water can not only damage the materials on the site, but it can also soften the ground, which hurts the structural stability of the project. Water needs to be emptied onto a street that has a stormwater system or pumped into tanker trucks to be hauled off-site safely. Initiate salvage activities quickly. Sort out the damaged and undamaged materials, cover all equipment that has become exposed due to the storm, check for leaking gas lines, check for downed power lines, and ensure fire protection systems are restored to the property as quickly as possible to avoid additional damage and expense. Lightning strikes can cause damage to construction equipment and construction sites. While most finished buildings have a plan for lightning, those plans may not be in place at the outset of the project. Many construction managers forget about the realities of lightning, but every year there are 20-25 million cloud-to-ground lightning strikes in the U.S. That’s a significant number, and the tall equipment on a construction site is at high risk. 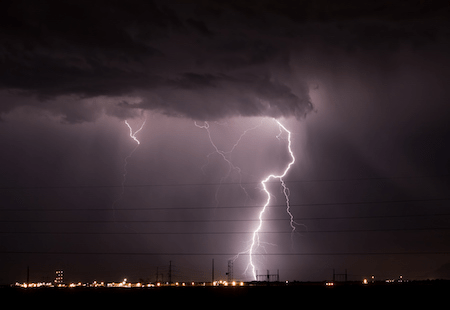 In order to protect a construction site and the workers on it, construction crews need to understand the risks of lightning strikes and what can be done to reduce those risks. Here’s a closer look at what precautions need to be taken to protect construction sites and personnel from lightning. Construction sites are at higher risk for lightning strikes. Steel erection of a non-finished construction project and large equipment, such as cranes or boom lifts, will attract lightning because of their height. During a storm, construction crews need to be aware of this risk. Construction workers and roofers account for 19% of lightning deaths, so the risk is worth considering. While lightning storms may seem minor, they pose a threat that construction workers need to take seriously. Lightning is the second leading cause of weather-related deaths in the United States. Even though it seems less deadly, lightning is more dangerous than strong storms. Lightning strikes kill more people than tornadoes and hurricanes. Consider the risk to equipment. Equipment that is struck by lightning while in use can be completely destroyed, because most of today’s construction equipment has onboard computers and diagnostics. Seek shelter in buildings. Every construction site should have a building or temporary building that is safe during a thunderstorm. Crews should be instructed to take shelter in a fully enclosed building and remain inside for at least 30 minutes after the last round of thunder has ended. React promptly when weather issues strike. Yes, the job needs to get done, but safety cannot be compromised. When lightning is spotted in the area, take appropriate shelter. Unplug electrical equipment. Before heading to safety, unplug any electrical tools and stow them out of the way to prevent overloading them should the site be struck by lightning. If the site has no enclosed building, an enclosed vehicle is the most appropriate place to take shelter. Keep the vehicle parked away from trees, electrical poles, metal fences or anything else that is tall enough to attract lightning. Remove metal gear. While metal does not attract lightning, it does heat up and can cause catastrophic burns if someone wearing metal gear is struck by lightning. During a severe thunderstorm, it’s a good idea to remove metal gear you are wearing. Get down. If you are working on a high surface and hear thunder or see lightning, get down as quickly as you can safely do so. Have fire extinguishers on hand. If lightning strikes wood on a construction site, it will likely cause a fire, so keep fire extinguishers on hand. Practice the 30-second rule. Sometimes you will see and hear lightning when it is still far enough away that you are perfectly safe to keep working. The 30-second rule says that if you see the lightning, count between the time you see the bolt and you hear the thunder. If you can count 30 seconds, the lightning is far enough away that you are safe. If you cannot count 30 seconds, you need to seek shelter. Stop crane operations. Cranes are particularly vulnerable during lightning storms. Land the load, lower the boom, shut off the electrical power, and leave the crane when lightning is in the area. Do not resume crane operations until 30 minutes after the storm has passed. If you live or work near a construction site and are concerned about safety during lightning events, here are some tips. Learn proper first aid for lightning strikes. If someone on the construction site is struck by lightning, someone trained in CPR could save a life. The sooner a victim can get help the better, and that help may have to come from a concerned citizen who lives nearby. Speak up. If you regularly notice the construction crew working in unsafe lightning conditions, talk to the site manager. Sometimes simply saying something can put a stop to the unsafe behavior. Stay back. Because of the tall equipment and buildings on a construction site, it’s wise to stay away during a lightning storm. If lightning strikes a person, administer first aid and call for emergency response quickly. If the person is not breathing, administer CPR until emergency personnel arrives. If lightning strikes a building under construction, the biggest risk is fire. Have fire extinguishing equipment on hand to put out the fire. Be aware that in buildings that have completed walls, the fire can burn inside the walls slowly for an extended period before becoming obvious. It’s best to call the fire department to have the property inspected. If lightning hits equipment, damage from power surges is possible. Power surges can hurt the wiring in construction equipment. Disconnecting the electrical systems can help prevent this, but be aware that damage can occur. Contact the insurance provider promptly after the incident. The site’s insurance coverage may cover any damage, so contact them as soon as possible after the lightning storm. Safety Services Company: What Should You Know About OSHA Lightning Standards? Hurricanes and lightning storms often have some warning, but earthquakes do not. Every day, between 50 and 80 earthquakes occur around the globe. Thankfully most of these are either under the water or are mild enough not to cause problems, but each year there are around 100 earthquakes around the globe strong enough to cause damage. While seismologists do try to predict coming earthquakes, they cannot predict them accurately enough for construction sites to plan ahead. Also, earthquakes do not always happen on fault lines, which adds to the frustration of trying to plan around them. That said, construction sites in earthquake-prone areas can take some measures to protect their work and their crews from unnecessary injury or damage during and after an earthquake. Here are some tips to help ensure the site is as safe as possible. Ground displacement can cause uneven surfaces. Be aware of this when entering the construction site and preparing for repairs after an earthquake. Fire is a serious risk. Broken power and gas lines leave the site vulnerable to fire. Flooding is possible near waterways. Broken dams or levees can allow flooding in normally safe areas. 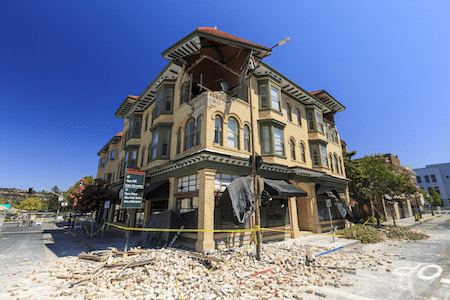 Buildings can topple in an earthquake. This includes buildings that are not yet complete, and some construction projects will be at higher risk because their earthquake protection measures may not be completed. Since earthquakes come without warning, it’s best to be prepared at all times. Here are some precautionary steps that construction sites can take. The safe places normally chosen, like under a table or desk or against an interior wall, will not work on a construction site. Aim to be away from the building, which could collapse, and away from any large equipment. Remember that most accidents after an earthquake happen within 10 feet of the building, including construction site buildings. However, try not to move too far from your current position, as the farther someone moves during an earthquake event, the greater the chance of injuries. Technology has improved significantly in recent years, resulting in structures that are much more likely to be earthquake resistant. By implementing these strategies early in the construction project, you can limit the amount of damage to the site and the risk of injury to construction crews. Drop, cover, and hold on is an earthquake safety measure that anyone can practice, regardless of where they are when an earthquake hits. It refers to dropping to hands and needs, covering your head and neck with one arm and crawling to the closest shelter, then holding on to something steady until the shaking stops. Finding shelter is the challenge during an earthquake on a construction site, but even a large piece of equipment or a tree can serve as a shelter when needed. OSHA recommends practicing this technique at least twice a year, and at least once per new construction site. This is a key preparation step because, in the chaos of the moment during an earthquake, people may experience moments of panic. By preparing ahead of time, you can help prevent injury during an earthquake. Broken gas lines, even near construction sites, and damaged electrical components or electrical lines can cause fires. Also, the motion of the earthquake itself can release sparks, leading to a fire. If your construction site is near areas prone to earthquakes, keep an earthquake emergency supply kit on hand to protect yourself and those on the site with you. It is difficult to control equipment and vehicles during an earthquake, and they can be deadly. After an earthquake, do not enter the construction site. If you suspect there are injured or hurt individuals, do not enter the site. Leave that to first responders. The entire area could be unstable, and you could become a victim while trying to help others. Clear a path for first responders. If the path to the construction site is blocked, help clear a path so first responders and rescue crews can get on the site. Only jump in to help with recovery if you are qualified and able to do so. Rescue professionals are trained to rescue people safely without putting themselves at risk. Make sure you are not entering the rescue if you don’t have the right knowledge and training. Consider bringing clean water to the rescue and construction crews. Water lines can be damaged after an earthquake, and you can help by bringing clean drinking water to them. Know that after the shaking stops, there is always a possibility of aftershocks. For that reason, you should not return to the site or work until you are confident all risk has passed. If there is a clear path away from the construction site, exit as quickly as possible after the shaking has stopped. A construction site is not somewhere to be during aftershocks, so encourage the entire work crew to get away quickly for their safety. If an aftershock hits, the area will be still recovering from the damages of the first quake. 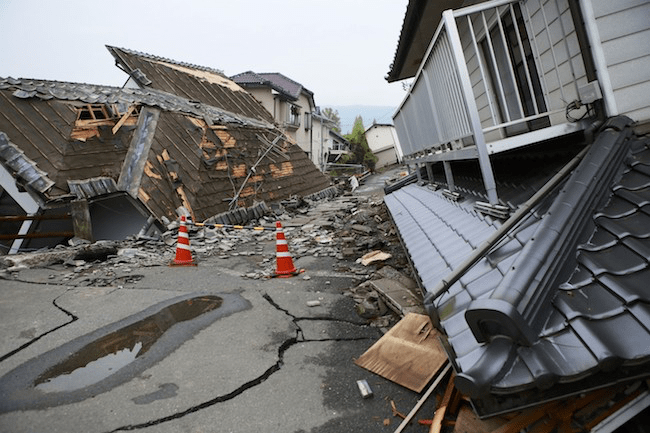 This means that the infrastructure could be weakened and not prepared for additional milder shaking, and the risk of a damaging collapse is higher. Only enter the site to assess damage after all risk of aftershock has passed. Stay in contact with emergency personnel or a weather and emergency radio to learn what is recommended. If trapped, find something to tap to help rescue crews find you. Rescue crews are trained to listen for tapping on pipes or whistling, so use these tools to ensure you can be safely found. Wear protective clothing during cleanup. Long sleeves, heavy boots, and work gloves can protect you from damage from sharp objects that were dislodged during the shaking. 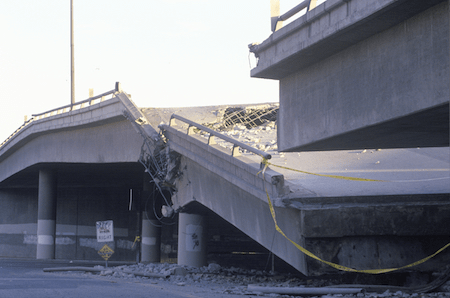 Building Design and Construction: Ready for Earthquakes? 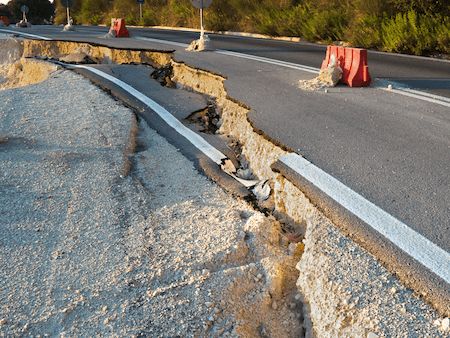 While earthquakes, hurricanes, and lightning are the most obvious types of disasters that can hurt construction companies, many other risks can occur. Fire, tornadoes, and flooding can all also cause serious problems and costly bills for construction companies. While it’s impossible to know the future, there are steps that construction sites need to take to ensure they are prepared for potential risks that could hit their areas. As a risk, fire is fairly universal. Fires can occur in any part of the country, any time in the year. Construction crews need to understand what to do to avoid this risk and protect themselves. Construction sites are particularly vulnerable because of the large amount of hot work and electrical equipment on them, combined with the incomplete fire detection and prevention systems. Between 2010 and 2014, 3,760 fires in structures under construction and 2,570 fires in structures under major renovation were reported, leading to 9 civilian deaths, 116 civilian industries and $280 million in direct property damage. Each year, an average of 1,253 tornadoes occur in the United States. With wind speeds over 200 mph, these are significant storms that can cause brutal damage to a construction site. Tornadoes can occur anywhere in the country, but they are more likely to occur in “Tornado Alley.” This is the band of land between the Rocky and the Appalachian Mountains where tornadoes are the most common. Tornadoes rarely have sufficient warning to warrant significant changes to a job site, so it’s critical to be prepared at all times. Flooding can occur after other types of natural disasters, or it can occur due to problems like dams or levies that break. Flooding can even occur when water rises exceptionally high due to snow melting or heavy rains. Sometimes the rains occur away from the area that floods, but the runoff water flows into a lower area. 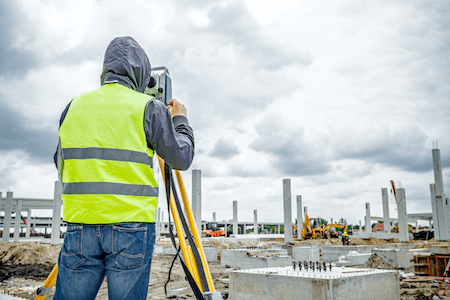 Here is a closer look at each of these risks and what can be done to protect construction workers, equipment, and sites. To protect a construction site from fire, here is what you need to know and do. Identify the fire risks on the site. Fire risks are found everywhere on construction sites. Gas leaks from lines that are not completed properly, sparks from electrical equipment, and even the flames from soldering equipment are just some of the risks. Learn to identify and then lessen fire risks on the site. Create a fire safety plan before starting the construction project. Every crew member needs to know what to do in case of a fire and how to properly put out the various types of fires possible on a construction site. Set up temporary fire alarm systems. Again, the permanent fire alarm systems are not going to be up and running. Using a temporary fire alarm system will help alert people on the construction site to any risks that occur so that they can get to safety in time. Keep heaters away from combustibles. The heat from construction site heaters can lead to a fire, so place heaters properly. Perform “hot work,” like grinding and welding, away from combustibles. This is a leading cause of fires on construction sites. 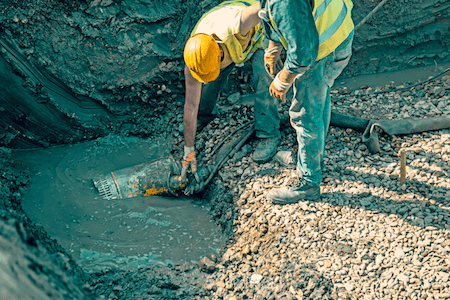 When possible, replace hot work with cold work that does the same job, but when not possible, have a safe and dedicated area for this type of work. Have a fire extinguishing plan in place. Have the right size and material of fire extinguishers on site to ensure you can put out any fires that do develop. Understand that permanent fire protection is not in place on a construction site building. Fire protection systems, like automatic sprinklers, are not yet functional in a building that’s under construction, so all it takes is a spark to destroy millions of dollars of work. Store combustibles safely. Combustible chemicals and materials must be on a construction site, but you can take measures to store them safely. Carefully control the use of open flames. Do not allow open flames on a construction site unless absolutely necessary for soldering. Waste management and cooking should use other options. Practice good housekeeping. Keeping the construction site clean will leave less material to start and spread a fire. Insist on cleaning well after jobs. Designate a smoking area far from the construction site. Ashes and sparks from lighters are one of the primary causes of fire on construction sites. If crew members must smoke, they need to do so in a safe location. Evacuate immediately in the event of a fire and call 911. 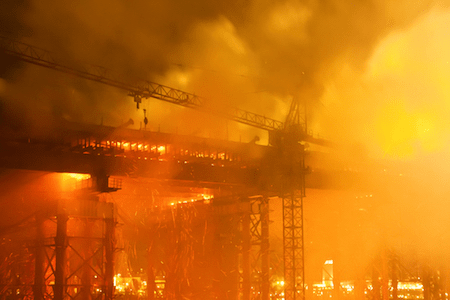 Fires spread quickly on construction sites, so don’t mess around if one starts. If you notice a fire starting on a construction site, or suspect any smoke is coming from the site, alert authorities immediately. The cost of a construction site fire can be in the millions of dollars, so the sooner emergency vehicles can get on the site, the better for everyone. Report fire safety issues that are not addressed by the site managers. OSHA requires this, so do not let safety issues go unchecked. Report to your local fire department or fire safety office. Tornadoes cause extensive damage wherever they touch down. They can pop up seemingly out of nowhere when a rainstorm turns violent, and they can devastate a construction site that happens to be in their path. Here are some tips for dealing with the risk of tornadoes or the aftermath of one. Identify proper tornado shelters. A proper tornado shelter is a location away from doors and windows in a permanent building, if possible. Since this is rarely possible on a construction site, look for a nearby building that can be used as a tornado shelter. Avoid buildings with flat, wide roofs. Keep a weather radio on hand to monitor the weather. Know what the weather is doing so you have time to take action if a tornado pops up, especially during the summer and stormy spring seasons. If in construction equipment when a tornado warning sounds, exit the equipment and turn it off. Construction equipment can become airborne in a tornado, so you will need to get out of it. Have an alarm system to warn workers of the pending storm. Make sure workers have time to seek shelter if a tornado warning or watch is issued. If the local tornado sirens cannot be heard well on the construction site, have a loud warning system of your own. Always know who is on site so that all workers are accounted for at the shelter. Have sign-in procedures and rosters, so management knows who is and is not on site. Empty the dumpsters. If there is time, such as in a tornado watch instead of a warning, empty the dumpsters. This will limit the amount of debris you must clean up after the storm. Secure everything you can. Again, this is only applicable in a tornado watch, not a warning, but take time to secure equipment, supplies and other valuable things. Don’t forget to secure scaffolding, portable toilets, and tools that may fly during a tornado. If you are not part of the construction crew, stay away from the construction site. During a tornado, there are far too many risks on a construction site, so seek shelter far from it. Finally, floods are a risk that construction sites need to be aware of and protect against. Often, floods do come with a little warning, except in the event of a levy or dam breaking, but they can cause delays and costly damage to the construction site. Here are some tips to help protect the site and those around it. Identify any risks based on the site location. Is the site near water? Does it have a natural drainage? Is there a way to add drainage? Use flood maps to assess this risk, then take measures to ensure the area can properly drain when needed. Understand the impact of sediment runoff. Often in construction, the contour of the land is important to the construction project. When sediment runoff occurs, defining property boundaries can become difficult. Also, the grading that has occurred to make the building project possible will be damaged. Have a plan to protect equipment and personnel if the site floods. Creating a site flooding plan if you are at risk for a flood will save lives and money. Assess the materials that will be damaged by flood waters. Steal construction material may be fine if it gets wet. Plasterboard or composite wood will be damaged. If you suspect a flood is coming, elevate those materials that need to be kept dry. If you are caught by a flood without warning, dispose of damaged material before moving on with the project. Build portable barriers to prevent flood damage. Gates or flood walls and even sandbags can all help reduce the risk of financial damage and loss from flooding at a construction site. Store electrical and mechanical equipment above projected flood heights. If there is a flood warning, make sure electrical and mechanical equipment is stored above the flood water’s expected level. Understand the risk of contamination from chemicals. Flood water can be contaminated with chemicals that are stored on a construction site, and this puts the surrounding community at risk. If a flash flood warning is issued, evacuate the area. Flash floods can kill in an instant, so take these warnings seriously. Even construction equipment is not safe from flash floods. Never wade in flood water on a construction site. Because of the high risk of contamination, flood water is not safe. Wait until the water recedes or have it drained properly before entering the construction site to assess the damage. If you notice flooding concerns at a local construction site, contact the local authorities. Many cities have Stormwater Management Divisions or similar groups that handle flooding concerns. Report these concerns promptly to help prevent contamination and other issues from flood waters. If flooding near you goes through a construction site, be aware of the additional risk of toxins the waters carry. Always stay out of flood water as a result. A natural disaster, no matter how small, can cause millions of dollars of damage to a construction site, hurting both the construction crew and the company paying for their services. To prevent this, construction crews need to understand the risks and how to avoid them, so they can move forward confidently knowing they will be prepared when a disaster strikes. Those who live near construction sites also need to know what these risks involve so they can take measures to protect themselves and their properties from potential risks the site poses. With this guide, you can be safer around construction sites, even when natural disasters strike.